A little over a year after the illegal Amona outpost was evacuated by the Israeli government, 25 Israeli settler families from Amona moved into their new homes in the illegal Amichai settlement — the first official Israeli-government sanctioned settlement to be built in the occupied West Bank in 25 years. Israeli media reported that the settlers would inaugurate their homes in an official ceremony, on Monday. The Amona outpost — which, like other settlement outposts, are illegal both under international and Israeli law — was slated for demolition following a 2008 Israeli Supreme Court decision, after eight Palestinians from neighboring villages successfully petitioned to remove the outpost on grounds that the construction was carried out on privately owned Palestinian land. After years of appeals from right-wing Israeli government officials, and attempts by Amona settlers to prove they had legally purchased the land, an Israeli police investigation in May 2014 found the entirety of the outpost to have been built on private Palestinian lands, and that the documents used by Amona residents to try claim their “purchases” were in fact forged. According to Ma’an News Agency, in February 2017, Israeli authorities evacuated the Amona settlers, who aggressively resisted their evacuation, resulting in the injury of dozens of Israeli soldiers who did little to suppress the violence. 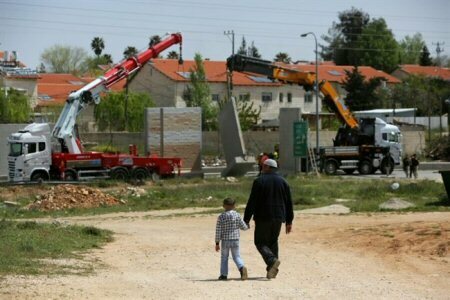 Israeli news website Ynet reported that 15 other settler families will move into the Amichai settlement after the upcoming Passover holiday, adding that the settlement is set to be home to 1,100 families in the future. “Amichai has been in full swing with connections created to power, sewage and water systems, at an estimated cost of tens of millions of shekels,” Ynet reported. While the Amichai settlement, which was built in violation of international law in occupied Palestinian territory, has access to electricity and running water, dozens of Palestinian communities across the West Bank live in Area C — under full Israeli security and civilian control — and are prevented from accessing water and electric infrastructures. Meanwhile, plans for Shvut Rachel East — another illegal Israeli settlement to be established between the existing Shvut Rachel settlement and what is to be Amichai — were advanced in February, also under the pretext of compensating residents of the Amona outpost, despite Amona’s evacuees refusing the relocation plan. Shvut Rachel East has been referred to as a “neighborhood of Shilo settlement,” by Israeli authorities and not considered an entirely new settlement, despite its considerable distance from the built up area of Shilo. “Under the disguise of ‘compensation’ to the Amona settlers, two new settlements, located one next to the other, are now in the making,” Israeli NGO Peace Now said of Amichai and Shvut Rachel East last month. Israeli human rights organization B’Tselem has also argued that settlers acted as “envoys” of the Israeli government in pushing land grabs in the occupied Palestinian territory, allowing the government to officially detach themselves from the settlers’ violent and illegal actions, while avoiding or blocking any legal penalties that could be imposed on the settlers, except in the most extreme of cases.